I’m an Android nut, no question about it. I have three Android phones sitting on my desk, three Android tablets floating around the house, and even a Cr-48 Chromebook. I’ve embraced the Google ecosystem, and nearly all of my digital data–from music to contacts to files to photos–resides on Google servers. As a marketer, however, I take a critical eye to how Google articulates and presents their solutions. As Android has evolved over the years, I’ve also evolved from utter frustration to iOS envy to a feeling of superiority over all other mobile operating system users. And, as Google hired more designers and non-technical product and marketing staff, it was visibly evident in their products and their marketing materials. Android morphed from a collection of disjointed features to a cohesive and connected OS with a single and pervasive design theme. Google’s apps also started to look more and more similar, giving users a common set of metaphors and visual reinforcement that all of Google’s myriad apps and services were, in fact, being built by the same company. 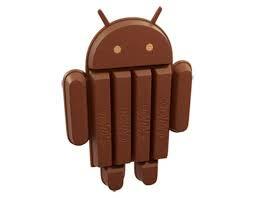 As backstory, there have been many rumors about Google’s upcoming Android upgrade. I’ve been rabidly consuming any and all speculation over the past few weeks related to Android 4.4, as well as their poorly-hidden Nexus 5 phone. 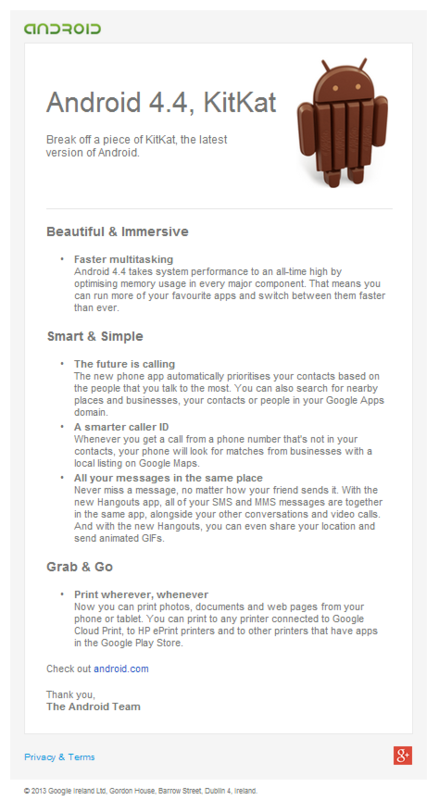 What I didn’t expect–given how Google has really upped their marketing game–was the weak, ineffectual, and uninspired Android 4.4 launch announcement I discovered in my inbox this morning. First impressions count, and this email is boring, drab and, dare I say, ugly. White, black, and, ugh, brown? Sure, there’s a tiny bit of green in the header, but, c’mon, you can’t look at this email and feel anything. I’ll bet anything that it was designed by someone with an engineering degree. It wasn’t sent to just developers, so why does it look like it’s for engineers? According to the footer, I received this email because I “previously opted in to receiving emails with product updates, new features, newsletters, special offers and market research related to Android.” That means that average people (i.e. consumers) are getting this email. It’s too detailed. Sure, people want details, but that’s what websites are for. This email tries to straddle the line between giving a lot of info and teasing enough to get readers to click through. But the textual nature of it causes it to look long. And boring. The call to action is at the end. And below the fold. And barely apparent. The call to action only appears once. Nothing else in the body of this email–not the Android logo, not the KitKat, not the individual bullet headings–is linked. When you finally do go to Android.com, you see a modern, responsive, interactive page. Why couldn’t the “smarter caller ID” header link directly to that content on the website? That’s not hard to do, especially when you have thousands of smart engineers in your company. Why no imagery? The website features great photos of the new OS’s features, but why didn’t they use any in the email? And if they decided to use one and only one image, why use the KitKat? That conveys nothing to the reader about the email’s content, especially if they are not already familiar with Google’s OS version nicknames.